31-Aug-2013 -- Over the years, I had amassed a tidy collection of Oklahoma confluence points. I could already sense, as I neared this point, that 36 North 99 West would be the one with the most scenic views of any that I had visited in this state thus far. It turned out that I was correct. The hills leading down to the Canadian River and up the other side, and the winding of US 183 amongst the riparian zones and hills were quite lovely. But let me back up a moment and mention that before these scenic moments came quite a bit of suffering. I was traveling south from 37 North 99 West, mostly down US 281 for the past two hours, and although I passed some beautiful areas such as Little Sahara State Park with its sand dunes, the temperature hovered at around 106 F. Did I mention that my car has no air conditioning? I contented myself with placing ice chips from this morning's stop at the Love's Convenience Store on my head as I drove along. This was the temperature on most of the bank signs in downtown Seiling, Oklahoma, while I drove through during the hottest part of the day. One of them said 109 F. It was a pleasant town. Once out of the city, I drove west on US 60 for a short time and then south on US Highway 183. It was here where the scenery really became beautiful on both sides of the Canadian River. In fact, the confluence point lies on a point of land that the river flows around in a large arc, flowing from the southwest to the northeast, rounding a bend, and then flowing to the southeast. At a cemetery, I drove west on E0690 Road. Things were going well until the point I needed to drive south on N2250. The red dust of Oklahoma was quite thick here and I was concerned about getting stuck. I pushed on toward the south, along a high field of corn, to an unnamed road. I took this to the west and rose in elevation. I considered stopping here, but instead took the chance on the road to its terminus, which was near the tallest hill in the area. The hill was also the site of a gas extraction facility. I was fortunate that this industry was so prevalent here, because otherwise the road network would be much less dense. I was now a few hundred meters, perhaps a half of a kilometer, southeast of the confluence point. I quickly donned hat and gathered supplies, setting off down the slope to the north-northwest. The temperature was not as hot up here on the high hills; I would estimate right around the same as the longitude reading: 99 F. The vista to the north before me was truly magnificent. I found the confluence a few hundred meters down the slope. The slope was a bit uneven with numerous holes, with an occasional prickly pear cactus, so care was required. I saw no animals or birds. The slope was about 15 degrees but flattened to around 10 degrees at the confluence, sloping to the northeast. Just to the east was a fenced area around which appeared to be more gas-extraction related infrastructure. I had stood on 36 North several times, from California on the west to North Carolina on the east. I had also stood on 99 West several times in the past, from a boat on Devils Lake North Dakota on the north end to Texas fields on the south end. I was on site only 15 minutes, intending to try for one more confluence point by the end of the day. This was my third confluence today but I wasn't feeling too tired yet. That, it would turn out, would come later in the evening during my very long drive back to Colorado. I reflected on the number of years that a visitor had stood here. So much in the world had changed, and yet so much still remains true and good--good people, good landscapes, the good Earth below my feet, the good Lord above. I hiked back the way I had come in, uphill to the vehicle. The car's interior was roasting hot. At the hilltop, I took a few photographs of the gas facilities there before gingerly driving over the cattle guard and back down the dusty roads. I filmed a video along the way but fortunately had no incidents nor did I get stuck. Back on US Highway 183, I reached US 60 about 15 minutes later, and then drove due west, hoping to reach 36 North 100 West before sundown. Would I make it? #1: The confluence of 36 North 99 West lies in the center foreground of this photograph, looking north. #2: GPS reading at the confluence point. #3: Ground cover at the confluence point. #4: View to the east from the confluence. #5: View to the south from the confluence. #6: View to the west from the confluence point. #7: Cross in the ground about 25 meters south-southwest of the confluence. 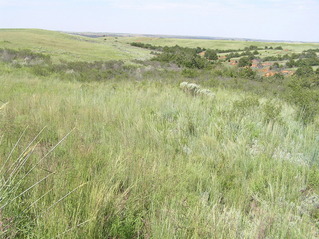 #8: Western horizon from 25 meters southwest of the confluence point. #9: Joseph Kerski at the confluence of 36 North 99 West. #10: 360-degree panoramic movie filmed at the confluence with sound (MPG format).